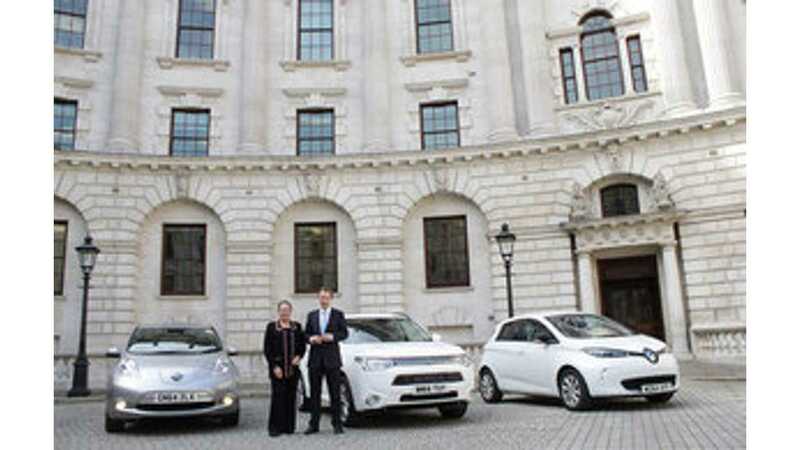 The UK Government, as announced in 2014, spent part of £5 million on 140 plug-in cars and vans for fifteen government departments and agencies. Average price is unknown. What did the government buy? 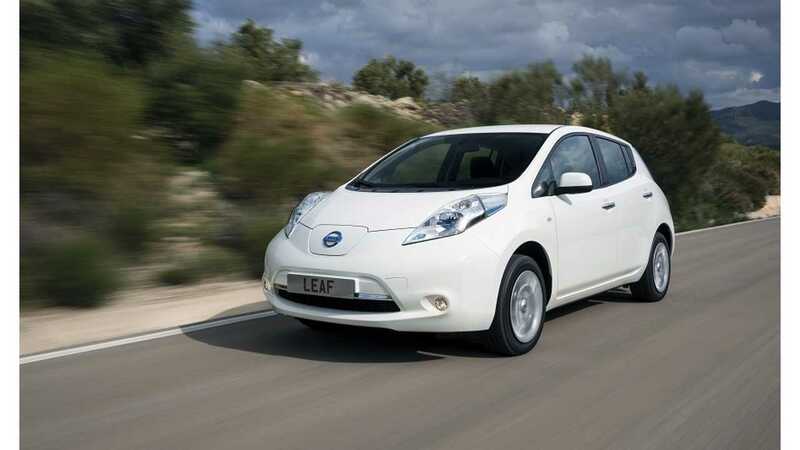 The press release lists only the Nissan LEAF, but the Renault ZOE and Mitsubishi Outlander PHEV are both visible in the provided photo. Some other outlets indicate that the purchase included Toyota Prius Plug-Ins, Kia Soul EVs and Volvo V60 Plug-Ins. No numbers for each car were provided. And we don't know if they ordered a Tesla Model S.
"The £5 million investment will also fund take-up by the wider public sector – including councils, police forces and the NHS – of plug-in vehicles and pay for charge-points to be installed to allow the vehicles to be charged at work. ULEVs are a major area of growth for the hugely successful UK automotive sector, which is worth over £11 billion to the economy." "This is an important step. These cars will save taxpayers money on running costs and will bring low emissions benefits to our fleet." "Today’s announcement proves that Britain is leading the electric charge while supporting the growth of this important industry." "I have led the drive for electric cars and vans across government because – with much lower running costs and close to zero emissions – this is the right thing to do for both the environment and the taxpayer." "This government is also investing significantly in ultra-low emission vehicles, and I recently launched a £10 million battery prize for UK scientists to ensure that we are world-leading in this major new technology." "We want to make the UK one of the best places in the world to design, manufacture and sell ultra-low emission vehicles. This important step demonstrates government’s commitment to promoting the economic and environmental benefits of these cars." 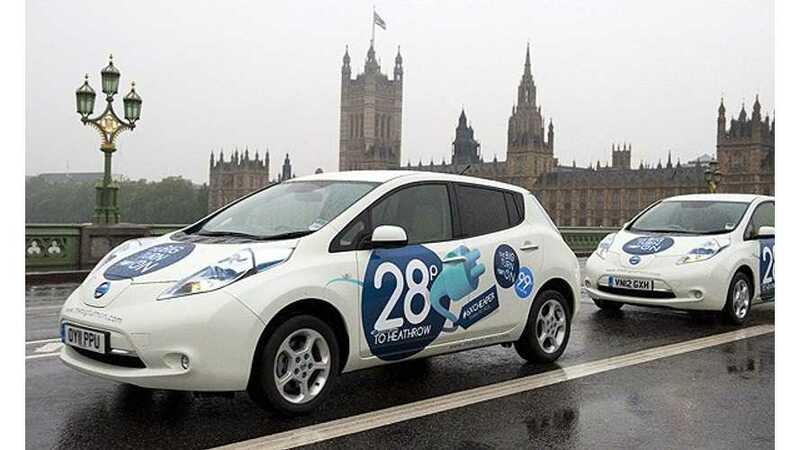 "The investment forms the latest part of a £500 million package set aside for ULEV vehicles announced last year."